And so, at this point. And I had a big question in my mind. While I know how dull-witted I am, her face seems to be showing some uneasiness, confusion, and fear. To be honest, I am really concerned. I want to keep it like this for a while. The eventful May was about to end. Under the high temperatures akin to summer, I boarded the Limited Express as usual. The weather’s great, and the sun dangling in the sky lit the carriage. When heading towards Tokyo, I would sit by the left side of the carriage, for I would face the East once we depart. Thus, I would avoid the afternoon sunlight, and could still see the computer screen. But even so, ever since I started conversing with Nitadori on April 17th, I never got the time to work on the train. Last Friday, on the 23rd, the After Record ended smoothly. We were progressing into the 8th episode of the anime ‘Vice Versa’, the second volume of the original light novel series. The story’s now in the so-called ‘Side Sin’. For some reason, Sin ended up in modern Japan. He was in the midst of military training, and thus appeared in full armor, dressed with bodyplate, sword and helmet. Sin was curious to everything he saw, and Shin, who wanted to live a peaceful life, was completely befuddled. The 8th episode was clearly meant to be comical. During the After Record, the studio was buzzing with laughter. The anime staff added a lot more emphasis to the culture gap Sin experienced when he came to modern Japan, making his curiosity look idiotic. I supposed it was because there was time for it in the anime that the number of scenes of Sin ‘dying’ (and reviving) far exceeded the original work. Like him drowning in a lake after jumping in with full armor. Running at a truck, only to be knocked aside, fell over a bridge, and died. Trying to see if he could use magic in Japan, finding out he could just to get blown up by his own offensive spells. Such changes were completed, as the series composer had familiarized himself with the original work. As he bore the mission of being the ruler of a country, technically he could not die in Reputation. Bluntly put, even when his subjects die, he can’t die. In that case, he should at least die many times in this isekai called ‘Japan’, to understand the pain of death. In this story, Sin’s foolish deaths are all reasonable. Shin didn’t know Sin’s true intentions, and was left completely flabbergasted. But even so, Shin couldn’t just let Sin be. Sin would be violating the no-weapons law just by walking around, and if he were to continue living in Japan, he would have easily broken the law without knowing. And if Sin was to be charged, Shin would be the first to be arrested. But even though he would shout, it was unlikely the police would believe him. Left with no choice, he had to bring Sin back to his house. But just like the former, his mother soon found out. And again, just like the former, his mother easily agreed for some reason, so Sin started living at the Tsumizonos for the time being, while Shin’s father was out at work. In the manuscript of the tenth volume that was to be sold in July, I had Shin’s mother act as though she had known Sin before. Thus, there was a foreshadowing in the eighth episode. Basically, once Shin’s mother met Sin, she showed a slight change on her face. If there’s a second series of the anime, I supposed it would link up to the ending I can currently think of. The anime should then be able to make use of the knowledge Shin’s mother knew of, as established in that eighth episode. Sin lost his mother since young, so surely he would obey whatever Shin’s mother would say, and be a ‘good boy’, at least at home. The ending of the eighth episode remained the same. The childhood friend Yui who came to Shin’s house mistook Sin for Shin, and there’s a nice mood formed. Was acting as a girl who showed up twice. Her role was Shin’s classmate, Yui’s good friend. Just to note, this girl has no name. She’s an original character for the anime. Based on the positioning in the classroom, the anime staff had her designated as ‘windowside girl’–or to shorten her name, ‘Madoko-chan’. Madoko-chan had freckles on her face, and shoulder-length brown hair. The illustrator did provide a draft illustration. For plot effects purposes, Madoko-chan was very forthfront in personality. While Shin and Yui were always having troubles, she would yap off at them. And other than this episode, Madoko-chan would show up in the eleventh episode, squealing with her classmate. Also, in the twelfth episode, right before the ending, she would have a slightly extended conversation with Shin. Because of Sin’s (non-malicious) actions, the relationship between Shin and Yui was in utter shambles. Madoko-chan said some words to console Shin, to cheer him on. Of course, I didn’t write those lines; it’s an anime-original scene. Just to note, in the following last episode, the thirteenth, the story would depict Shin being warped off to Reputation again. Thus, Shin would be reunited with many characters again, and even Meek had a line. And on this day, Nitadori would be voicing the crowd along with the other actors, along with her role as Madoko-chan. It’s called a ‘mob scene’, or just ‘mob’ for short. It’s a little pretentious of me to say, but I thought Nitadori’s acting was fine. I had assumed that her performance would be affected after that happened, and that one week break she took, but it seemed I was worrying too much. I guess I’m relieved. There was nothing in particular to deal with on that day, so the editor-in-charge and I quickly left the studio. Shin’s voice actor did talk to me the previous week, but this week, I was not caught by him. From Monday to Thursday this week, I had an important event for a high school boy–mid-term tests. For the first time in over a year, I participated in these tests. The absence over this year was exceptionally long. I felt nostalgic when I had to write my class and name on the answer sheet. I thoroughly realized that I had really returned back to being a high school boy. Everything was fine from Monday to Wednesday. After the tests in the morning, I would head home, and seal off all thoughts about the novel–writing, actually. I would spend the time before I sleep to study for the tests the following day. I would spend the whole day studying, sometimes taking a break, looking afar. It’s a nostalgic feeling. The editor-in-charge also knew that I was having exams, so he would not contact me. Sometimes, I had to respond to emergency matters regarding the anime, so I was mentally prepared to some extent. Something happened about 5 hours ago, one that left me perturbed. It was noon, right after the tests had ended. But unlike the usual, I had ample time left. There was no need to hurry back home. First off, I had lunch at the school cafeteria, and I would take my time while heading home. Of course, it wasn’t Nitadori. The latter was still seated at her desk behind me, and till this point, I heard her stuff her items into her bag. That sound stopped as the girl was speaking to me. I remained seated as I turned my face towards the one asking. Standing there was obviously my classmate. This girl had short black hair, a little petite, probably very demure. We had approximately two months of classes together, but I never remembered her name. I never spoke to her. I supposed she’s not the girl…who questioned me over Nitadori. She looked down at my face tentatively. I really didn’t know what she wanted to say. Looks like something bad’s about to happen, I guess? I should be running away now, right? Once this scared looking girl said this, her face suddenly changed expressions, probably to shake off all doubts. Woah! Thank you! Thank you! I faked a cough, covering my mouth. It’ll be bad if she realizes I’m all giddy with joy. So, I can’t do that. That’s because I did edit the part I recited, and the editor-in-charge told me, “Nice plot, but it’s a little messy.” So I had to finetune it. Also, I had to ensure that the plot development afterwards would be logical, so I’m currently editing the draft of the eleventh volume. There was the sound of a chair shaking at the seat behind me. Surely it was from Nitadori. Was she tense? Smiling? Angry at something? I didn’t know the reason. Maybe all these emotions. I had to say something to this certain smiling classmate, so I, still unable to turn my head around, started to think. I immediately thought of three ideas. First off, and the easiest, would be to tell the truth. But once I had this thought, I immediately understood that it was the worst possible course of action. If I stated my secret, she would surely ask me lots of this. I wouldn’t be sure if she would keep this secret. And most importantly, she would further question me, why I would read such a new plot development during class time. In that case, she might end up knowing that it was because of Nitadori, and that I might divulge her secret. Leaving my own matters aside, no matter how bad it got, I swore that ‘even if I have to die’, I would keep the matter of Nitadori being a voice actress a secret. If only this girl before me is to be angry. But if she’s to say this, what do I do? So I had to keep lying. I had no confidence that I could continue doing that. The last option, the third one, well, that’s pretty clear. So I decided to do this. Saying that, I dashed out of the classroom. As I had to pass by the back door that was closer, I ran by Nitadori. I could see Nitadori seated on the chair, trying her best to stifle her laughter. She appeared as though she was not involved in this. And that was the conversation that started between Nitadori and me. I guess Nitadori couldn’t hold it in anymore as she laughed out loud. She really was enjoying herself. It’s a good thing there were few passengers from the station were just left from. Miss Kamishiro, seated to the right, remained silent. I decided to deem her as a Zashiki Warashi or something. Leaving aside what we’re discussing, she’s able to not converse with me in formal language, and that’s good. It’s also a good thing that she’s willing to smile. I don’t want to talk about anything serious, on the train at least. Even if we’re not on the train, honestly, I don’t have confidence in maintaining a conversation with Nitadori in ‘Stella’ mode–when she’s using formal language. I think it’s more precise if I say “I don’t have confidence in conversing with Miss Stella Hamilton”. Stored inside are the usual, my favorite salted seaweed flavor. I said as I accepted it heartily. I could at least joke around easily. Nitadori too was able to joke around easily. I think it was very good. There was no need for her to brood over me. I was feeling hungry, and munched at the potato chips, before the train conductor came to check our tickets. This week, it’s not the usual lady, but a young man I met for the first time. The conductor finished, and went to the carraige behind. I rolled up the packet of chips, slipped it into the shopping bag, and drank some tea. I really was having trouble with her. Tests finally ended, and I really wanted to motivate myself to write. But after reaching home and sitting before the computer, I couldn’t think of anything but this. I kept thinking about this, from the way from home to the station, waiting at the station, but I couldn’t think of a sure-fire way to settle this. Nitadori said in a half-joking manner. She briefed me on what happened after I escaped. Speaking of which, I did remember a family name called ‘Satake’ mentioned in class. Whenever I hear this name, I’ll wonder ‘Is she from Akita’? The Satakes are Akita nobles after all. She looks pretty ladylike, but she’s very lively and bold in nature. Since she mentioned this to me out of a sudden, I guess that has to be it. Miss Satake has outstanding athleticism, and it’s said she really stands out during gym classes. Nitadori had been skipping gym classes to prevent her wig from slipping off, and remained by the side. Thus, it seemed she had paid heed to this. She might have noticed the physical abilities of all the girls in the class. According to her, Nitadori wasn’t on good terms with Miss Satake. I don’t really understand which girls are on bad terms with Nitadori (I don’t understand the world of girls. They might have some kind of intense fights behind our backs.) In other words, they’re not the type of friends to sit together for lunch, or chat after class. That’s why Nitadori didn’t know either. 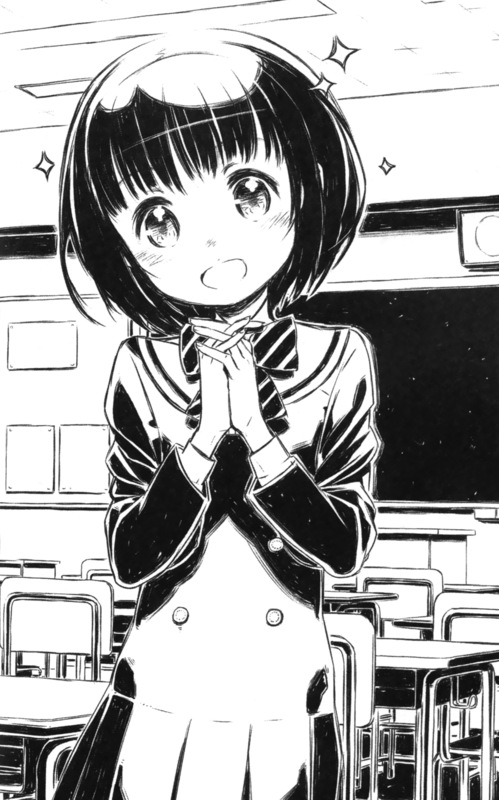 Nitadori stared intently at the back of the chair before her, saying this with a miffed tone. I didn’t know the reason at all. I’m really grateful to have a loyal reader, so I’m really happy to be able to hear the thoughts of a classmate of the same age group (though a year younger than me). Happy I was, this time however, I could not say so. That once I escaped, Miss Satake did not seem especially surprised. She muttered, looking a little happy..
Then for a moment, she exchanged looks with Nitadori, but neither of them said anything. Miss Satake returned to her seat, picked up her bag, and heartily left the classroom. Anyway, once the anime airs, I’m not sure if her name will appear in the first episode, she’s going to appear in the voice actors list on the credits. The family name ‘Nitadori’ is rare. Furthermore, the full name is the same, and she has acting experience too. Looking at these points, Miss Satake will probably figure it out. She was miffed at me. I see, so she’s prepared for this. Again, she was miffed at me. Now that she mentioned it, that’s true. But…we just talked about it. Wasn’t Nitadori the cause of this? I guess my stupid face had expressed my thoughts clearly. She threw a tantrum, and apologized to me. Well, leaving aside this skit-like conversation, Miss Satake is a huge problem. But she is a problem, so I’m left with no choice. During these ten seconds or so, we heard the train continue trudging on. I might have succeeded in escaping today, but starting next week, I will have to face her every day. I can’t escape unless I drop out or transfer out from school. I guess that’s why Miss Satake said “ah, he ran away”, since she understood this well. She said that without panicking, like a hunter knowing the drinking place of its prey. Ugh, I felt a shiver down my spine. Nitadori herself is a girl, but it’s a matter about her career, so I don’t think she’s the type to blurt it out. For Miss Satake however, I couldn’t be assured of that. After hearing that, Nitadori nodded sadly. I gave my second idea. I turned to my right, towards Nitadori. And found her seated there, giving a ‘goodness gracious’ face. Did I make such a ridiculous mistake? Her face is basically saying ‘I think it’s fine to point that out, right? But I might have to wait for him to figure it out’. Even this dull-witted me figured out that much. That there was a fatal flaw in the ‘second option. I never thought of this in the classroom. If Nitadori hasn’t showed a ‘grimace’, I would have lived a peaceful life until the ‘moment’ came. Her face was basically saying ‘ah, thank goodness this guy next to me isn’t a complete idiot’. What I recited hinted that Meek might revive, and it was planned to be in the 11th volume. Though the messy parts have to be edited, the plot will surely remain the same. Miss Satake will definitely read the 11th volume and recall this. Once it’s discovered that the plot is the same, anyone will realize that it’s not just some fanfiction. I really felt a chill inside my heart. If I had said it back then, the result would have been far worse than ‘since we’re fellow fans, let’s get along’. Since that part is going to be published anyway, I can only insist ‘that’s a part the author wrote’. In September, the facts will still match up. So I thought about it, and figured it was as Nitadori has said. Anyone can figure out the truth after some investigations. In modern society, it’s easy to find information through the internet. All she needs to so is to check on the message boards or the question and answer pages. And she’ll figure out that ‘in fact, Vice Versa isn’t a web novel’. Yes, it’s the author. I’m not joking. I said, and then I realized that reciting that part in class was a terrible decision. But I had a change of thought. If I hadn’t done so, things might have gotten worse. If I had said ‘that’s a doujinshi’, the outcome might be different, I guess? No, seems like it’ll be the same. I believe that the decision wasn’t a mistake. All that’s left is to settle this problem created by this chain of events. After hearing me out, Nitadori probably sensed that I had a good idea, and turned her bespectacled stare towards me. ‘Is this guy really okay?’ That’s the face she’s showing me now, I guess. But since I can’t think of any other way out, this has to be the best way out, right? I never expected this tragic reality of mine to be so useful here. I sense this ‘ordinary high school boy’ tag here is becoming distant from me again. With an inexplicable look of complicated feelings, Nitadori muttered again. I made my conclusion, decided to keep ‘running away’, and assumed this case closed for now. So I kept drinking tea as I looked out of the window. Under the blue sunny sky, the train continued to stop at the stations and race off over and over again. I could see a dazzling green amidst the mountains outside the window. I closed the PET bottle, and looked forward, before sensing a stare. Nitadori was staring at me with a silent, stiff face. I too peered back at her light green rimmed glasses, white nose, cheeks to her side. I was scared of staring into her eyes directly. But Nitadori did not say anything. Finally, I noticed that she might not be looking at me, but at the scenery outside, so I turned my eyes towards the window again. The train then entered the tunnel, and this time, my eyes met Nitadori’s, whose eyes were reflected on the window. Nitadori nodded away with a serious look as she voiced out. Even in the tunnel, her voice was loud, so I guess she was pretty loud. I knew Nitadori was trying to ask me something. As for what it was, I could only wait for her to continue. Miss Kamishiro glanced aside at me silently. Less than a second later, she turned her face aside, and looked forward, ‘none of my business’ so she seemed to be implying. The train left the tunnel, and the carriage got bright. The light shone upon Nitadori’s face. It’s a little early for sunset, but the sunlight was a lot less harsh than it was at noon. While Nitadori’s personality probably wouldn’t change because of this, to me, she had ‘become a different person’. Nitadori slowly moved her stiff face. I couldn’t predict what she would say next, and to be honest, I was really scared. What if she’s to say something hurtful? What shall I do? What Nitadori said however was something so trivial. I asked, my mood dampened. I was worried she would say something, but once she actually spoke up, I found it wasn’t anything. As for why Nitadori was asking in that manner, it remains a mystery to me. Thinking hard about it, I should have done so a long time ago. If we had our contacts two weeks ago, I could have contacted her easily after I got strangled. I didn’t know what to say, but at the very least, I could have told her ‘Don’t mind’. In any case, I regretted not doing so in the beginning. This time, I got her contact, I felt relieved. Ah, basically, I probably won’t get choked by Nitadori again. So while we’re exchanging contacts, Miss Kamishiro looked over at us from time to time, but never said anything. I had to switch the input manner to ‘reading’ mode, and had the smartphone store some data. But at this moment, I was wondering if I should classify her as a ‘work acquaintance’ like the others, or to classify her as a ‘friend’. I know it’s impossible for me to classify her as ‘family’, which contains only mom. Where do I put her? I kept looking down, and found NItadori typing something at a startling speed, but I shouldn’t be peeking. She’s a colleague, but a friend? No, isn’t this kind of vague? Won’t it be arrogant of me to classify a classmate I know at work as a ‘friend’? Without the person next to me noticing, I grouped her name under ‘friends’. She’s the first person in that group. To conceal this fact, I slipped the smartphone into my pocket, but it vibrated a few times. I squealed in surprise, and realized it was vibrating due to the new notification. It might be a message from the editor at the office. He did mention that he would contact me after the Mid-Terms were over. I took out the smartphone I had just kept, and looked at the screen. Who would appear on the screen? It was a confirmation message from NItadori, nothing much. The signals released several centimeters to the right would reach the relay station, pass through the internet, back to the relay station, and into my phone. That’s a long detour. ‘Please continue to take care of me’. Concise and positive. To me now, it’s something that left me most pleased. I looked at the sender, and saw the person to my right holding her cellphone. This horse sashimi-loving bespectacled girl was smiling. She suddenly made this request. It was the first time in my life that someone asked for a reply. ‘I haven’t sent a message to my friend’. Did she figure that out? Was she probing me? Or training me? If I send the wrong reply, will she start nitpicking at my habit? And delete the data before me? She might delete the data, and even the address. While I was left in the lurch with regards to this sudden test, the smartphone in my hand suddenly vibrated. Only to find that Nitadori too was taken aback by my squeal. The phone in my hand was vibrating in a different manner, and I understood that it was a call. On this Earth, there’s only two people who would call me. Ever since I received this device, there were only two numbers on my call logs, wrong numbers aside. Mom should be sleeping now, so there’s only one possibility left. Looking at the screen, I saw that it was from ‘AMW editorial branch’. AMW refers to ASCII Media Works. Tests were over, so naturally, the editor-in-charge contacted me. If he’s not sending a message, that means that I have to answer something. I had to pick up the call, but I could not speak while seated. It’s rude to talk on the phone while in the train. For the Limited Express, it’s common courtesy to speak on the aisle linking the carriages. I said, and Nitadori quickly got up to leave her seat quietly. Luckily, she’s not the type to say that sort of thing here. I thanked her as I passed by her. I had to reply Nitadori’s message once I was done with my call and returned to my seat, but I had to hold this meeting with the editor. I passed through the automatic door, and approached the place where I was strangled two weeks ago. And picked up the phone at this place, the place where the human silhouette might have been marked out with chalk. The call was regarding a request. Luckily, the editorial branch had decided on a ‘Vice Versa’ audio drama in the ‘Dengeki Bunko Magazine’ that was to be published in August. The editorial branch wanted to publish an interview involving the anime director and me, and needed my agreement. Of course, the interview would not reveal my identity, and I didn’t need to show myself. I never had an interview, but I had seen the interviews from other Dengeki Bunko authors. I felt that as long as I remained cautious in my answers, I could hide the fact that I was young, so I agreed. The editor-in-charge apologized for this sudden request, but to go along with the director’s schedule, once the After Record tomorrow’s done, the plan is to hold it in the cafe at the studio. I agreed to that then. There were few tunnels on this route, so I used this opportunity to discuss about ‘Vice Versa’ with the editor. The conversation included the following, that the subplot regarding Meek still had to be edited, so when would the discussions be done? Would the guest characters be done by the illustrator, like usual? And also, what about the eBooks that haven’t been published. 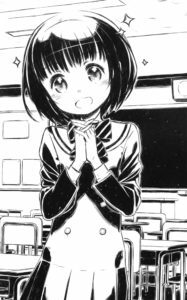 ‘Dengeki Bunko Magazine’ has an electronic edition, so the editorial branch had discussed the possibility of releasing a very short chapter there. All that was needed were a few pages, and since there were many days until the deadline, I accepted this job. Also, we had a chat about a new series. ‘Vice Versa’ isn’t over, but the editor wanted to push out a new series before it ended, so he hoped I would prioritize this. The editor’s thoughts was basically, don’t wait until this series is over before releasing the new work, but to start work on the new series before I’m done, and have me work on both series concurrently. I agreed with this strategy, so I decided to start thinking of new ideas on how to begin this. So we kept chatting on the phone, and I found that I spoke for almost 20 minutes. I took a detour to the washroom, and this time, before leaving, I took notice if there was anyone suddenly crashing into me. And then, I recalled the assignment from Nitadori. I had to respond to her. I returned to my seat, and wondered how I should respond to this person next to me. It’s really too difficult. I decided to think of what to write, send it, before returning to my seat. I took out my smartphone again, opened the message screen, and pondered over how to reply to this ‘please take care of me’. ‘Same here. Please take care of me’. I mistyped three times before entering this vanilla response. “And same here, same here. I have something to ask of you. Please take care of me.” At that moment, I thought using a haiku format would be interesting, but I gave up on that. I really wanted to praise myself. But even so, ‘is this really fine?’ I was wondering as I twice hesitated before the send button, and before I knew it, another three minutes passed, so I pressed it. The moment I did so, the train entered the tunnel, causing an error in transmission. I stood before the automatic door. I thought to myself that I had to let Nitadori leave her seat as I passed through the opened door, and entered. But Nitadori was not at the seat by the aisle. She was seated by the windowside, the seat I was at. She, who had her long hair draped before her chest, was seated there. She leaned her body towards the left windowsill, her eyes closed. I didn’t check, but she’s probably sleeping. I realized that Miss Kamishiro behind me had stood up. The latter whispered to me. I pondered, and rejected it. Without saying a word, Miss Kamishiro returned to that seat. Trying to be quiet and not shake the seat, I approached that aisle seat, Nitadori’s usual place. I looked left towards her, who was usually on my right. It was a refreshing feeling. Then, I saw something in her right hand, as she was obviously sleeping. Now, the failed transmission should be able to be delivered. I stared at the screen for ten seconds, did not send, switched off the screen, and slipped the smartphone into my pocket. And then, I leaned towards the back rest, lowered my head, and closed my eyes. And then, Miss Kamishiro shook my shoulders. Looking outside the window I was taken aback. The sky was dark, and the scenery was filled with streets of the city. The train was approaching the terminal. I was in a deep sleep. Time really passed quickly. I slowly gazed to my left, and saw that the one there was still sleeping soundly. To avoid waking her up, I silently removed my backpack from the rack, and nodded towards Miss Kamishiro. She too nodded back to me in appreciation. I stood with the other passengers at the door, waiting for the train to arrive. I flipped out the smartphone, and edited the message. And I sent the message.